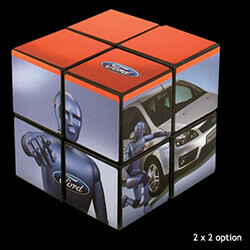 Puzzle cubes are the perfect promotional tool if you want people to get involved with your business. Studies show that the more people interact with a product that is providing them with a message the more likely they are to remember it later. Printing your business logo on a puzzle cube will ensure that people spend hours looking at it as they try to complete the puzzle. Something fun like a Rubik’s cube will also catch the attention of others passing by who will take on the challenge!, this will pass your message on to even more people without the need for you to invest in extra marketing. Puzzle cubes are the perfect option for a company giveaway item. You can pass these out at events to get people talking about your business. This fun game will catch a lot more attention when compared to more common items like business cards or flyers that everyone else will have. It will also look like your business is the type to go the extra mile which will resonate well with your audience. The multi-sided cube also offers you the opportunity to put a lot more information about your business in plain sight which will help you promote yourself more effectively. In addition to being a great marketing tool, printed puzzle cubes can make for great promotional items within the business. You can place one on each of the desks in your office for a fun pick-me-up for coworkers or something to entertain customers when they arrive for appointments. They can pass out extra cubes to clients or use them as a travel toy when travelling for business. Puzzle cubes could also make a fun holiday gift that employees could take home to their children after a company party. Cubes are available in a variety of sizes to accommodate whichever images you might have to use. Each side can carry a different image which will both increase the marketing potential of the cube and make the puzzle a bit more difficult to solve. The harder the cube is, the more likely it is that people will continue to play around with them for a longer period of time after they receive it. If you do not want to invest in something that is too hard for people you can pick a USB puzzle cube which gives the same idea without the need to solve a puzzle. The cubes are carefully printed and assembled to ensure that they will last without fading or tearing as they are handled. Each cube on the face of the puzzle will have a sticker that makes up part of the full picture. The stickers can be printed in full colour and arranged using a triptych style to create the full image. You can print a photographic image onto the stickers or use single colours to fill out each side. If you have a standard branding set you typically use for your business, the cube can be designed to match your current marketing campaign.